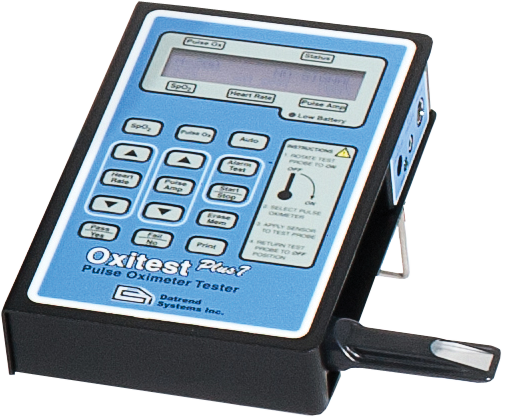 To further enhance your pulse oximeter testing requirements, Oxitest Plus 7 is compatible with Datrend’s ES601 Plus and other automated test systems such as the Fluke® Biomedical medTester 5000C. PHOTODIODENellcor and Ohmeda connectors Standard. Five automated test sequences for determining oximeter alarm response time to Low SpO2 ; Low Heart Rate; High Heart Rate; Low Perfusion; and Motion Artifact conditions. Allows temporary connection of Nellcor pulse oximeter sensors for selection of sensor-specific SpO calibration curve. Intended for high-accuracy testing of all Nellcor disposable and re-usable sensors.